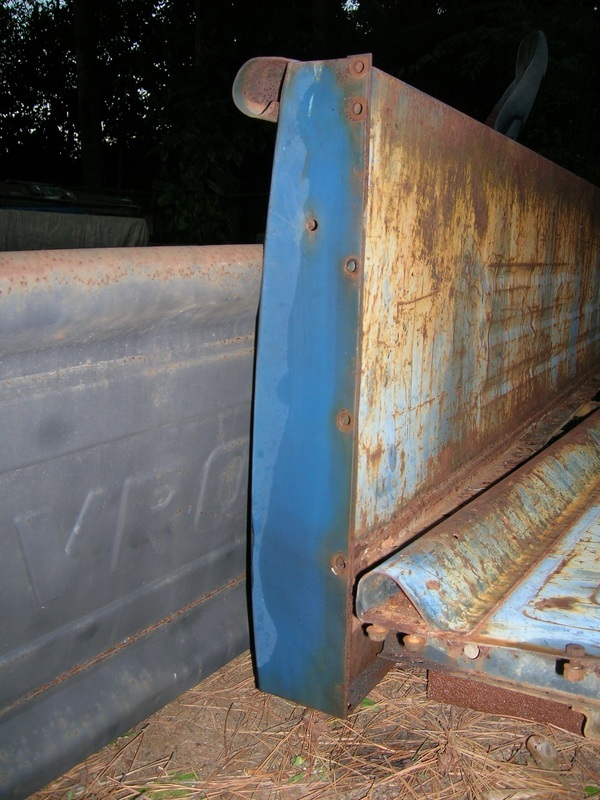 Welcome to my 1965 Chevrolet C10 Stepside webpage! I hope you come back often! Watch my progress on the BLOG page. Explore the different sections listed in the top banner. Ever since owning my first pickup, I've always felt a need to have one. I responded to a local Craigslist ad on September 18, 2011 and the rest, as they say, is history. I bought and towed it home the very next day. 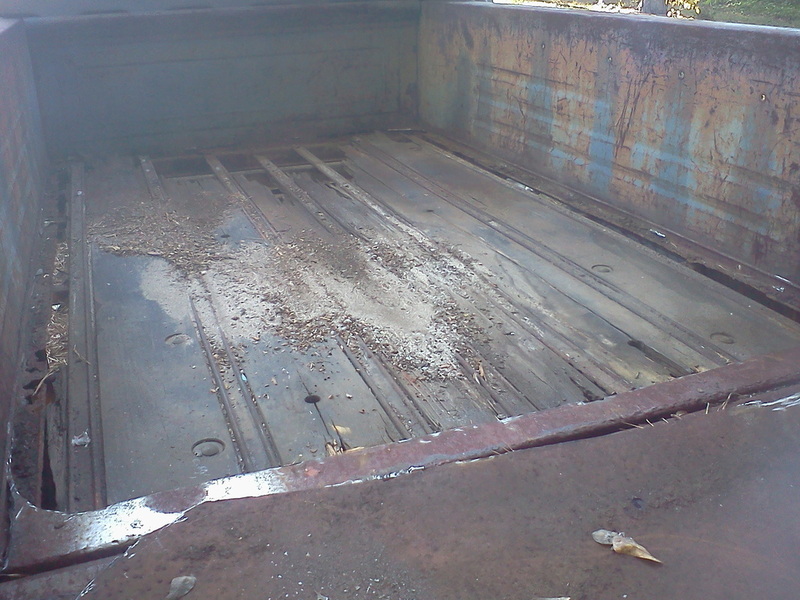 Being a South Carolina truck, I was very pleased to find very little rust in most of the "problem areas". 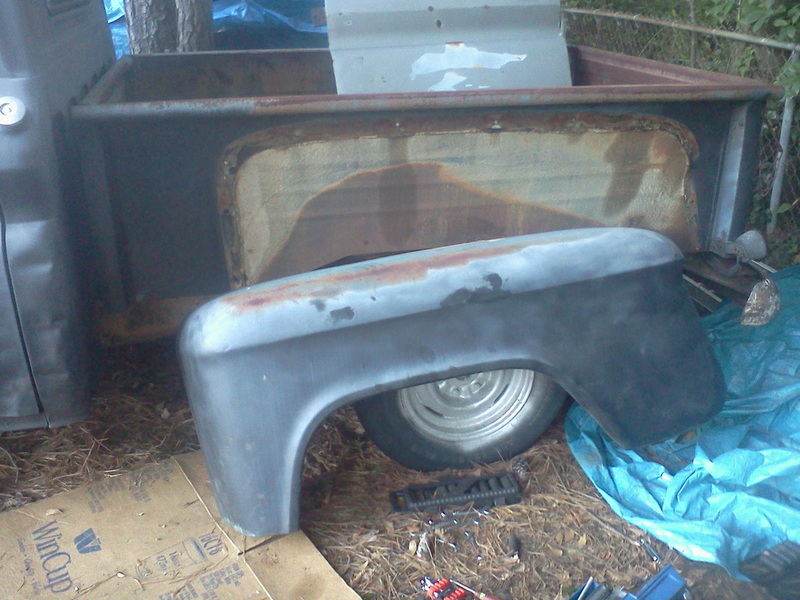 The cab corners, rockers, door bottoms, rear fenders, hood and hinges were all in great shape. 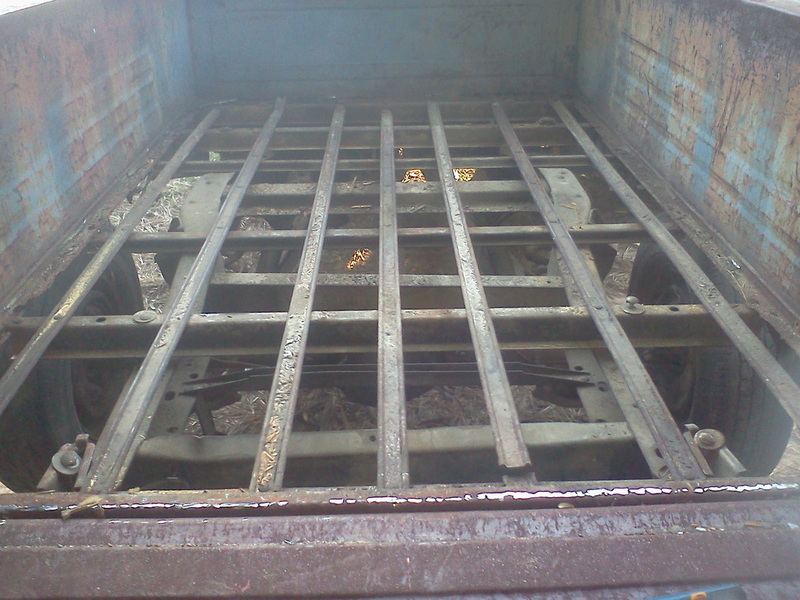 The glass was all there and in superb condition. It has 88K miles on the odometer. Windows opened and closed nicely and even the tailgate worked. I was thrilled to say the least. There are some issues that need solving. I have no idea if the motor runs and I really don't know when it was run last. 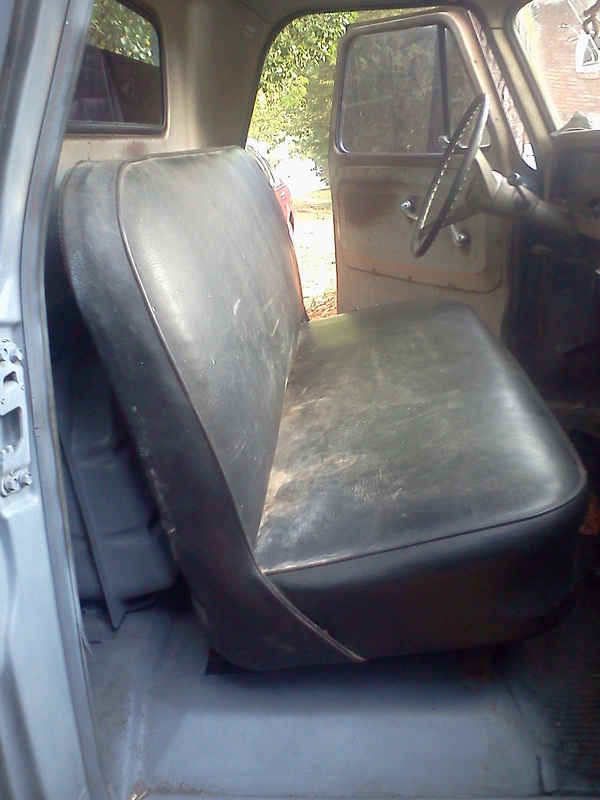 The original bench seat is missing. 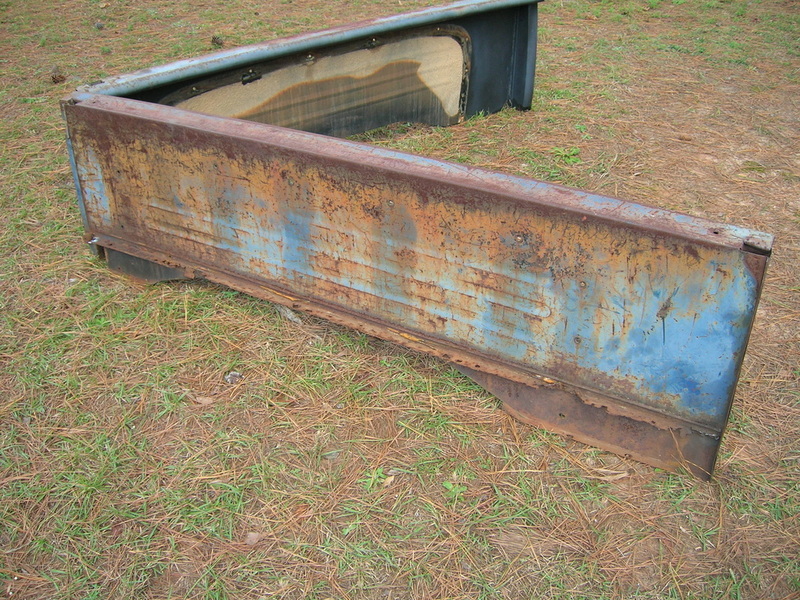 Also, someone welded a sheet of metal on top of the wood bed, so that will need to be removed. 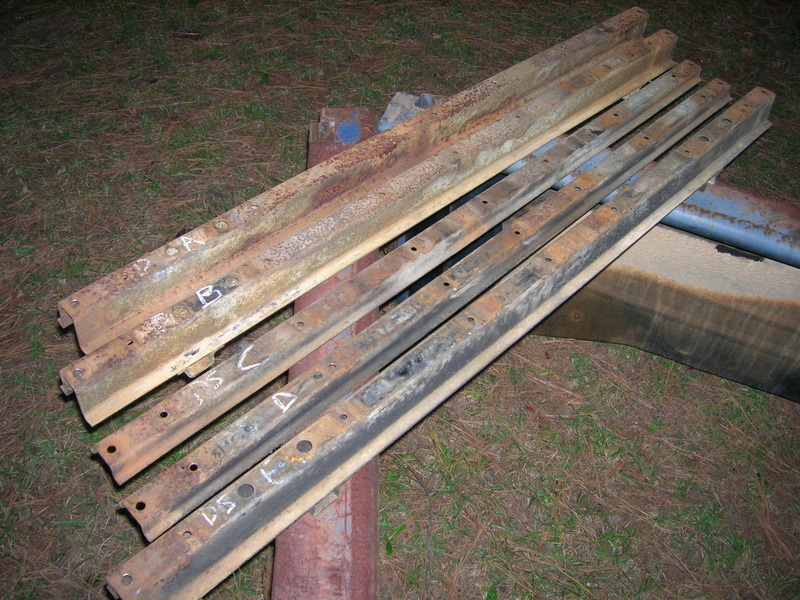 The original wood is still there. 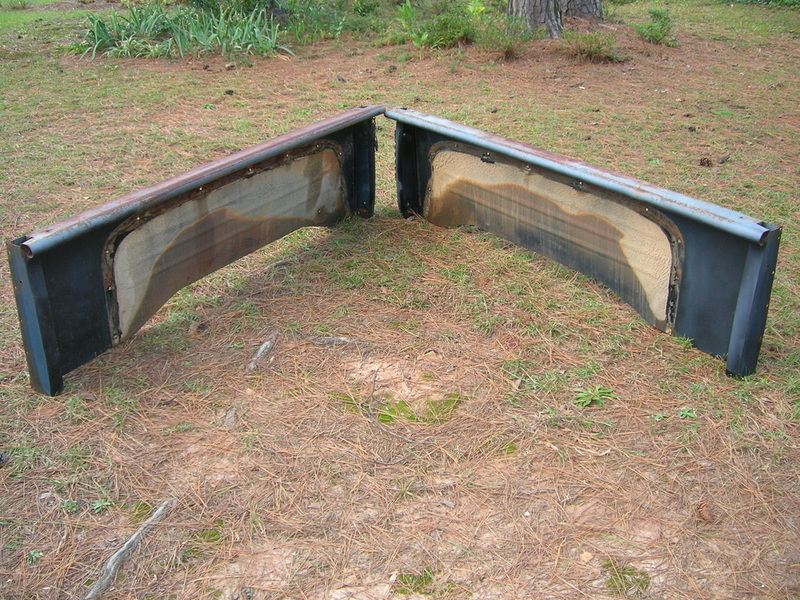 The back bumper is mangled too. 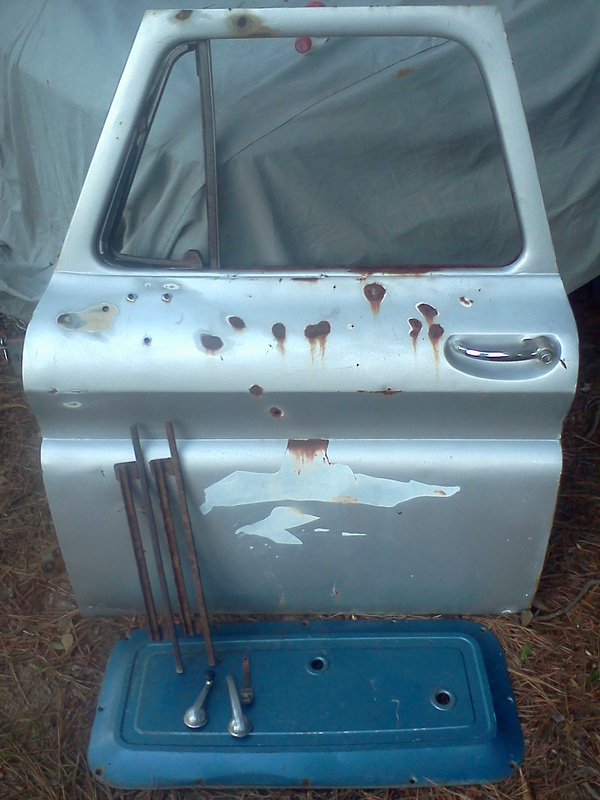 Both doors have some severe dents. I have no idea what condition the 3 speed manual transmission is in. It will be fun trying to get it back into good shape! 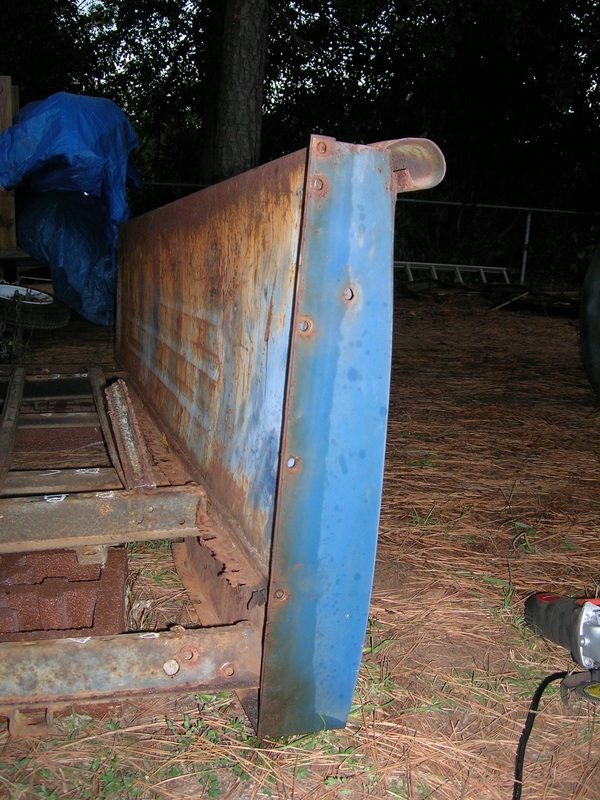 Bumper looks pretty bad - but the frame is OK! 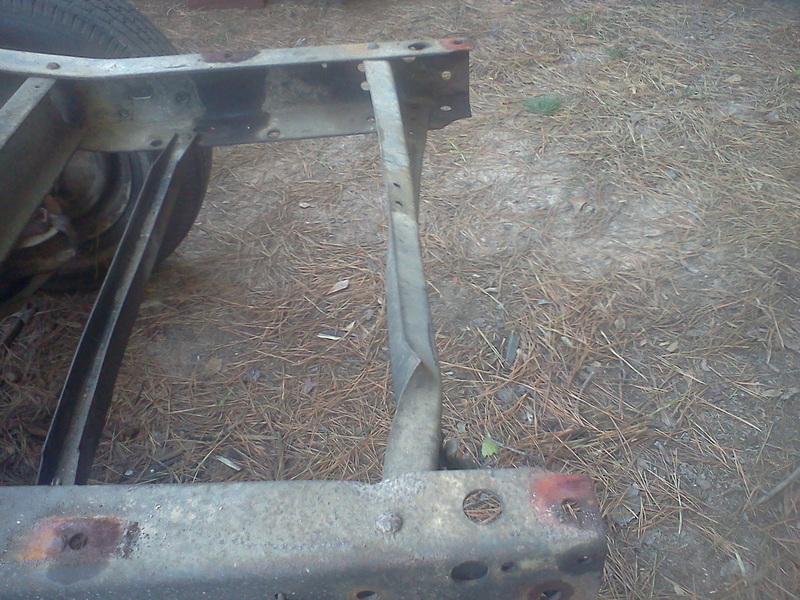 After removing the bumper, I bolted a tow bar directly to the frame. 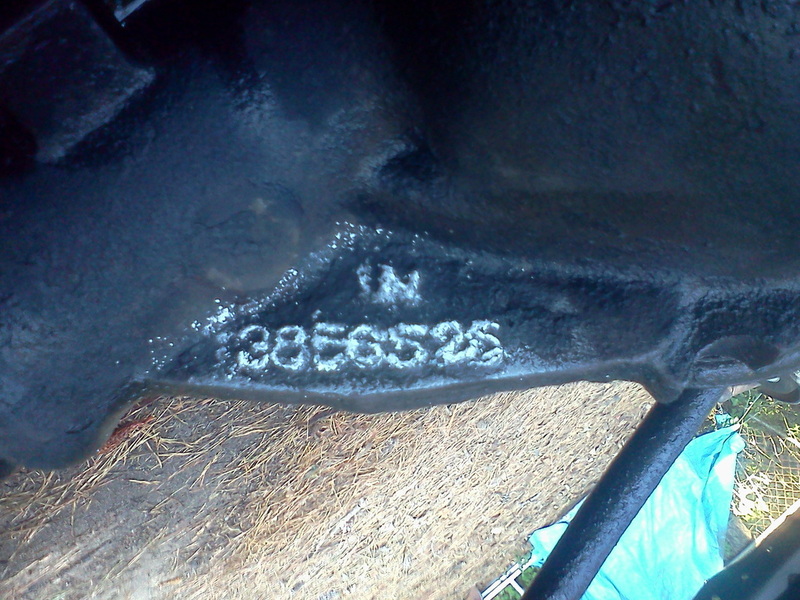 Motor is stamped F0707TA = 230ci inline 6 cylinder. PAINT = 538AA, WB = 115, CA = blank. Paint Code 538 is a two tone option. Dark Blue is the main body color and AA stands for Tuxedo Black as the second color. 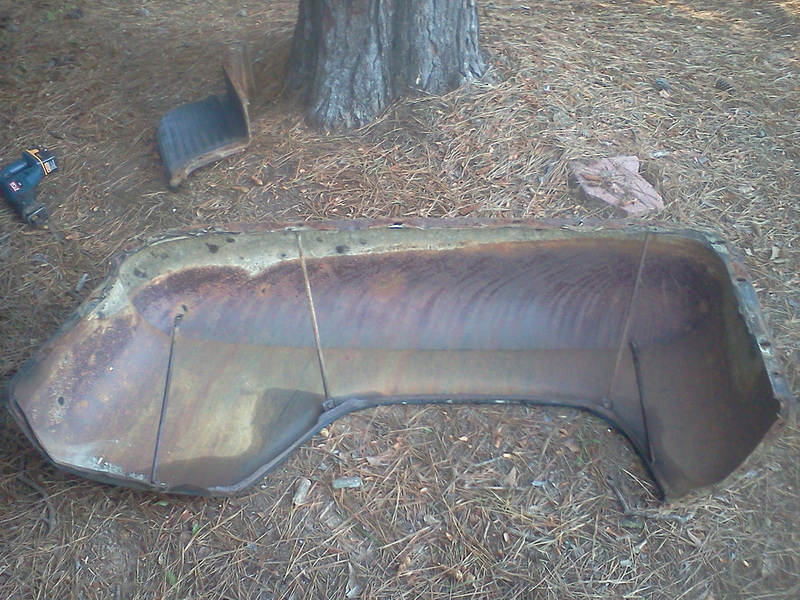 It looks like the grill and bumper are still black and maybe the roof was too from the bottom of the windshield up. 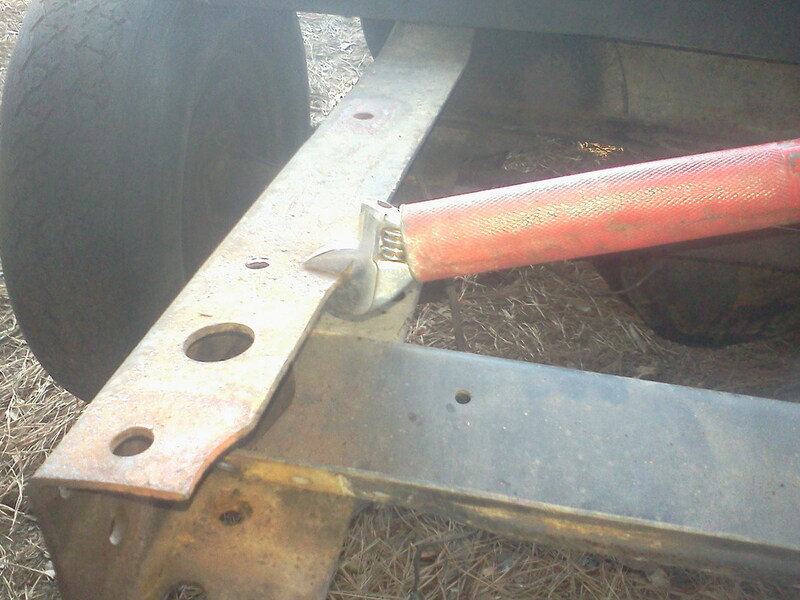 The tow bar will help save towing costs. It's easier to move in the yard and no more tow dolly! 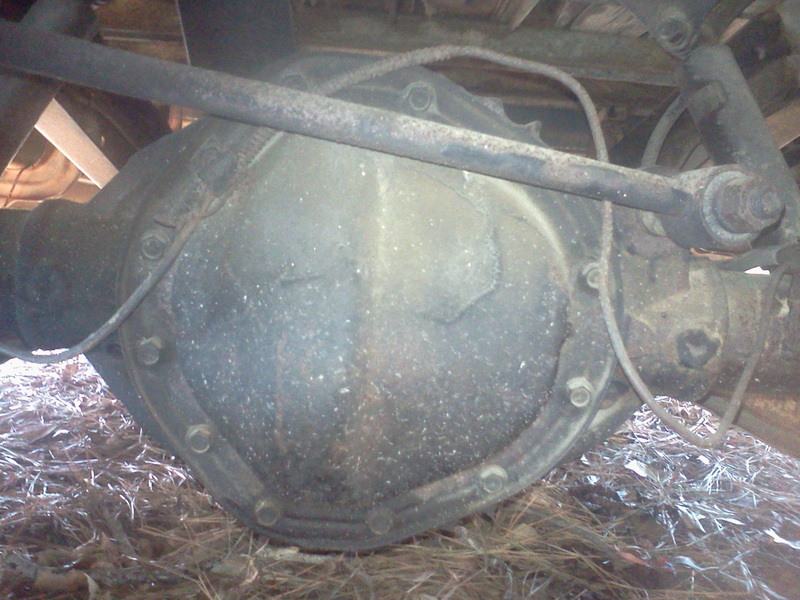 A view of the 12 bolt rear differential. This casting looks like N 3856525. October 8, 2011 was a great day. 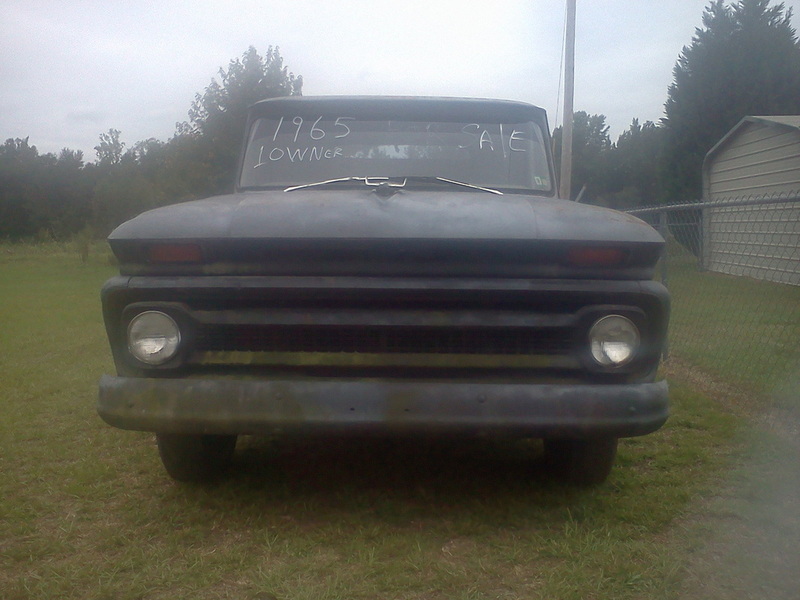 I stumbled across a 1967 Chevrolet C30 at the salvage yard. I was speechless as I opened the cab to see a really nice seat. 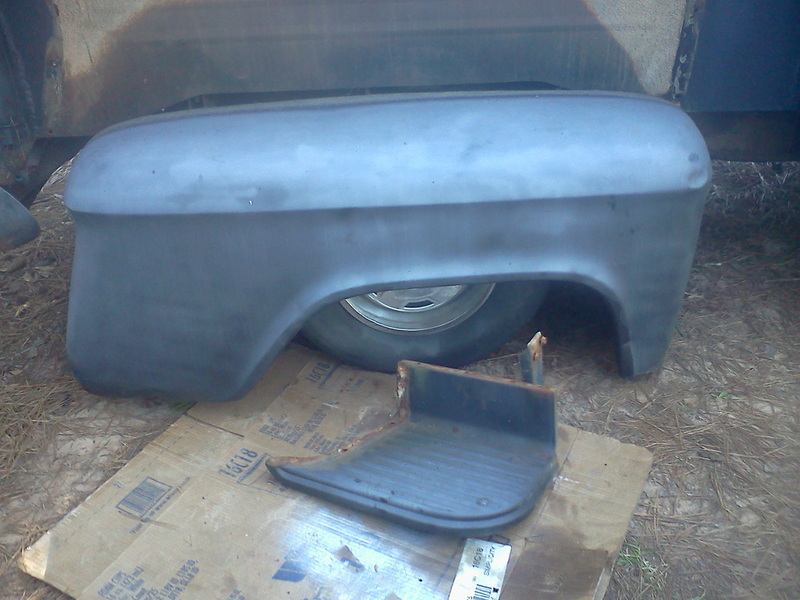 The seat in my C10 was missing when I purchased it. 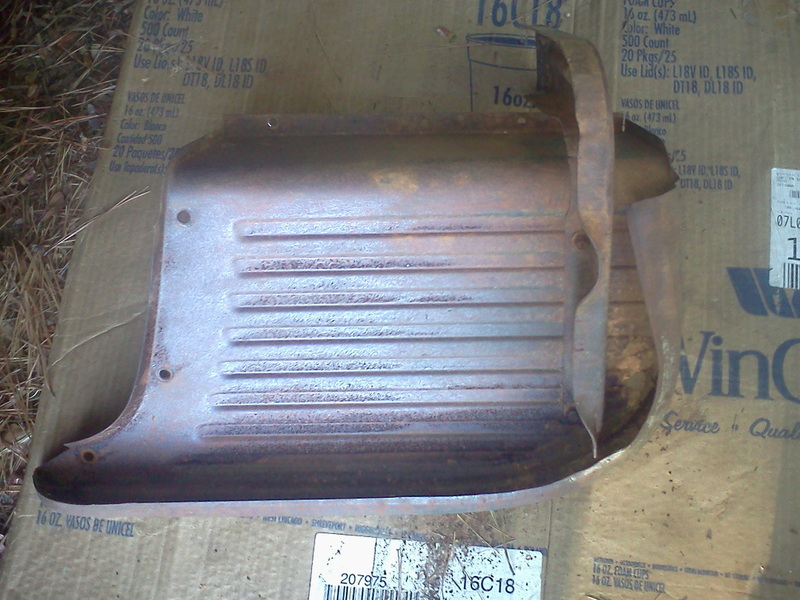 I am extremely fortunate to have found this 1967 seat. It bolted right in and I believe the 1967 frame is nearly identical to the 1965 model frame. 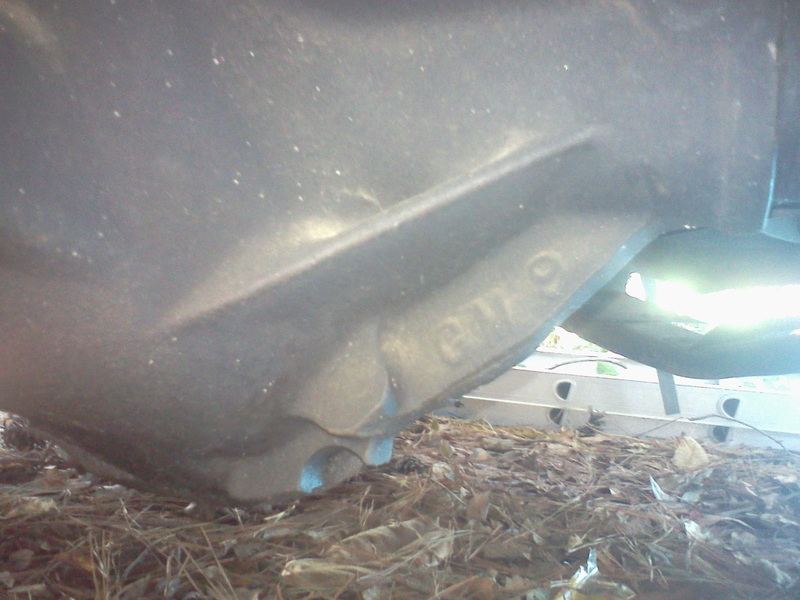 The seat vinyl is torn open at the seam on the driver's side, but with a temporary repair and a seat cover, it will be useable until the time comes for recovering. 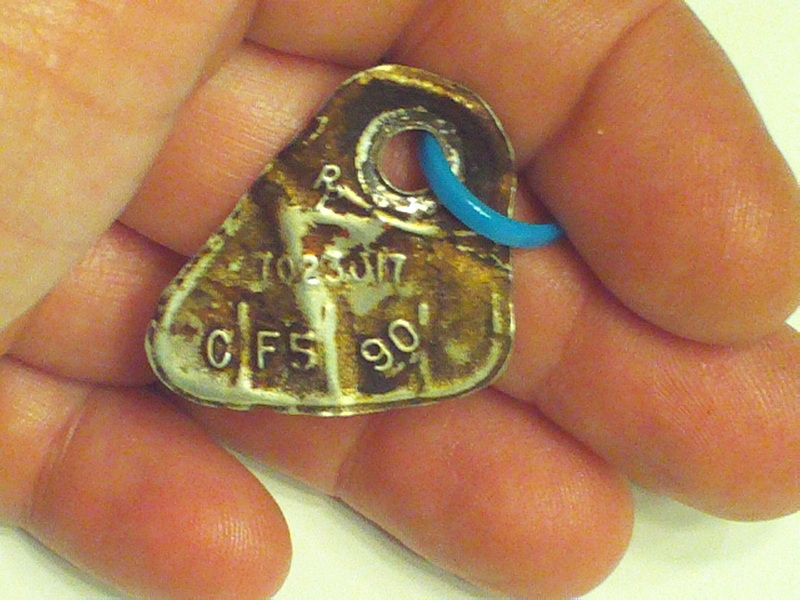 On 10/10/11 I carefully removed the tag from the carburetor. Can you see the "R" and a "P" just beneath it at the top of the triangular tag? The "RP" stands for Rochester Products. 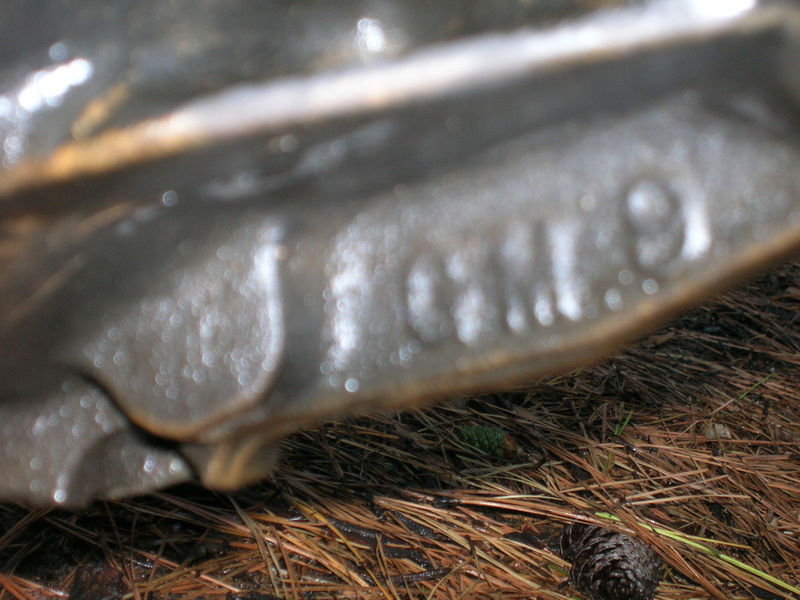 Kudos to Stovebolt.com forum member "Carbking" who correctly decoded the tag. 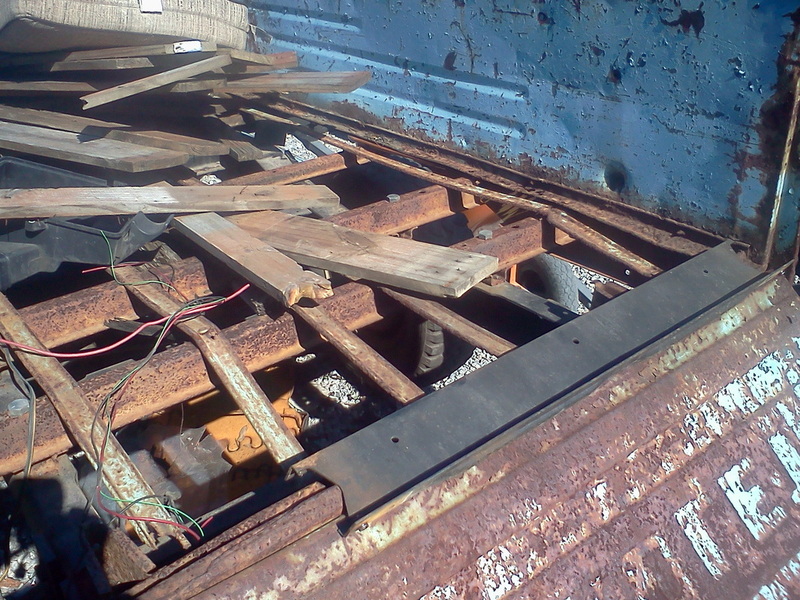 10/13/2011 - I'd been staring at this door at the salvage yard for over a week. I just wasn't thrilled with the condition, but today I decided that it was better than the one I have on the truck, so I brought it home. 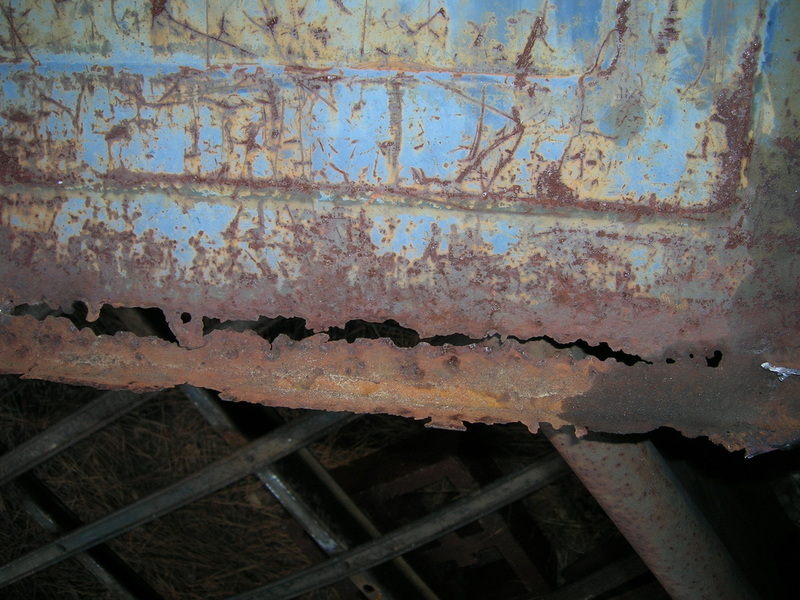 There is plenty of surface rust. The glass is gone. 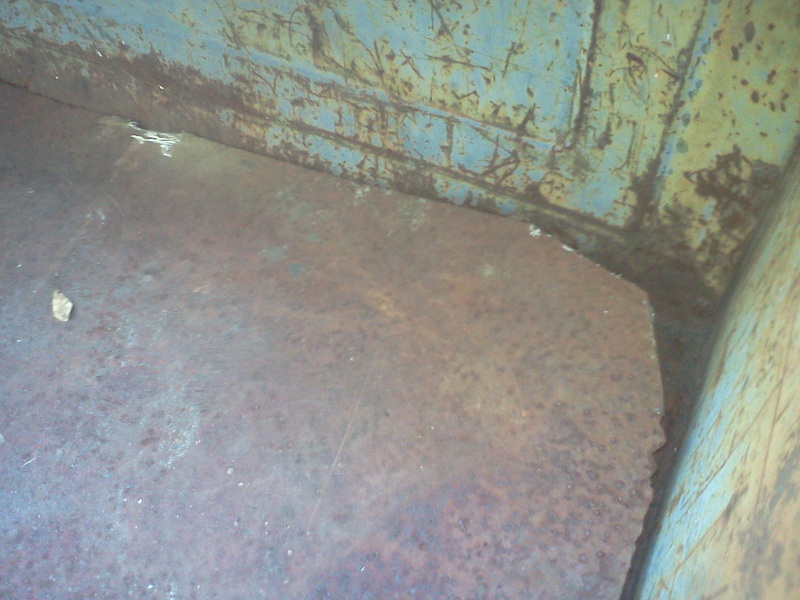 The skin is fairly straight, but the bottom of the door will require replacement. 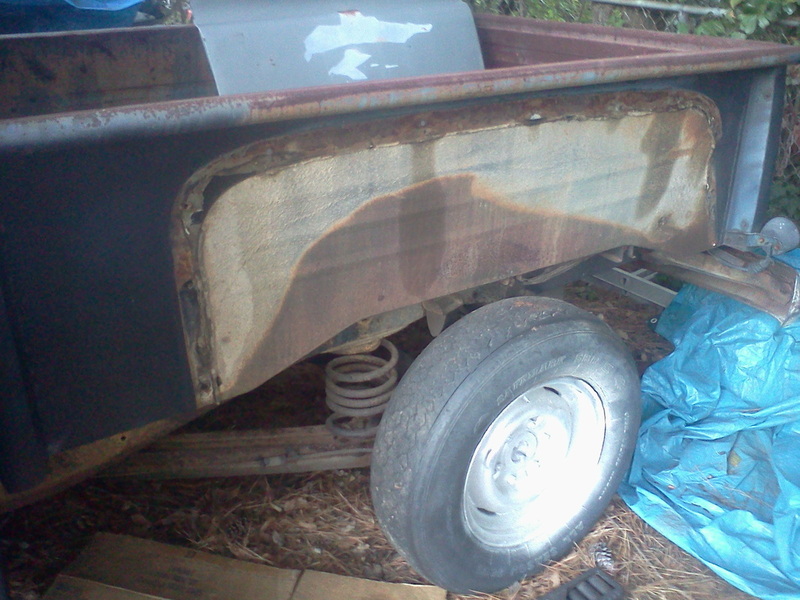 Thankfully, the truck's original door will make a good donor for patch pieces. Now I just need to learn how to weld!!! 10/14/2011 Taking the step off was not very easy. 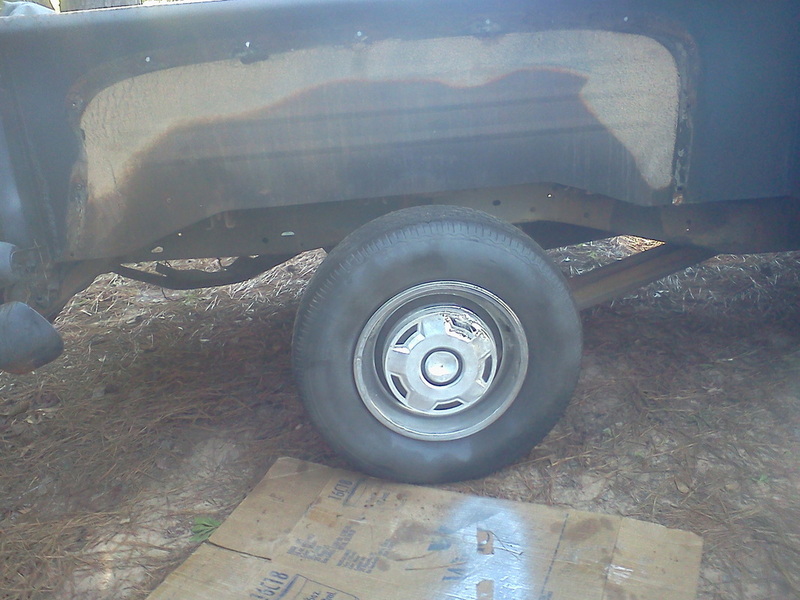 The fender came off much easier and I only had to use the sawzall once. 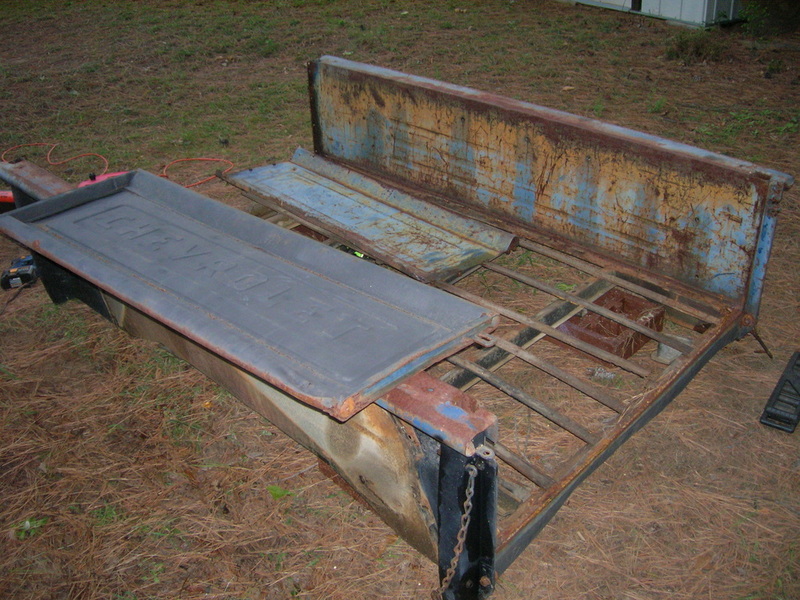 DS bed is in good shape. 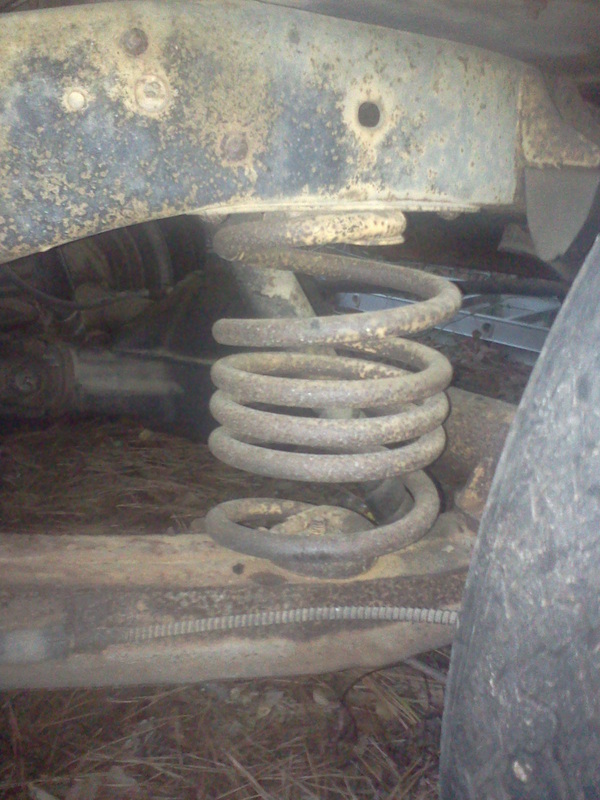 Rear springs? - Well . . I'm not so sure! probably be getting new rear springs. 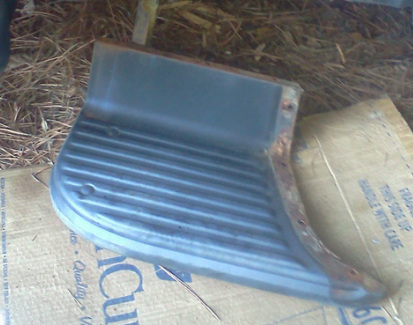 Looks like I'll get to practice some bodywork on the front edge of the step. Ahhh! Saturday!! Today I spent the whole day in psychotherapy. Or at least, that's how I like to think of it. 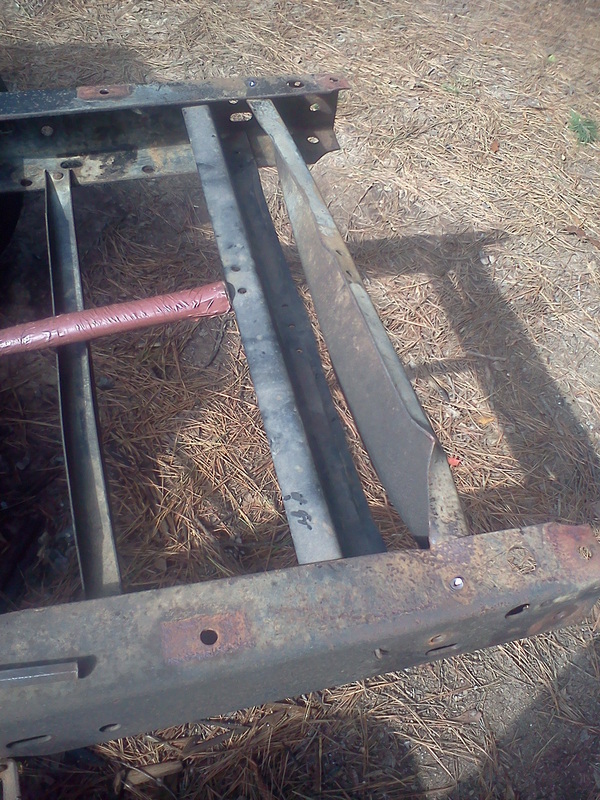 On 10/15/2011 I removed the passenger side step and fender, the rear bumper, the spare tire carrier, the metal plate that someone had welded into the bed, and finally, the rotten wood of the bed. What a great day! Pictures tell the story best! 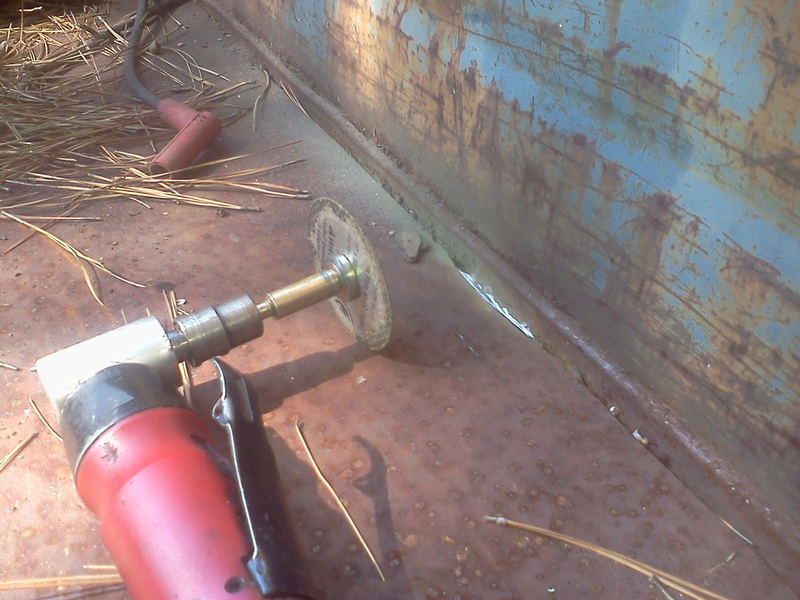 My air powered cutoff tool was not getting the job done. I had to get my 4.5" grinder and get serious! 10/21/2011 Removing the bed was a simple matter. it or just replace it with a new piece. 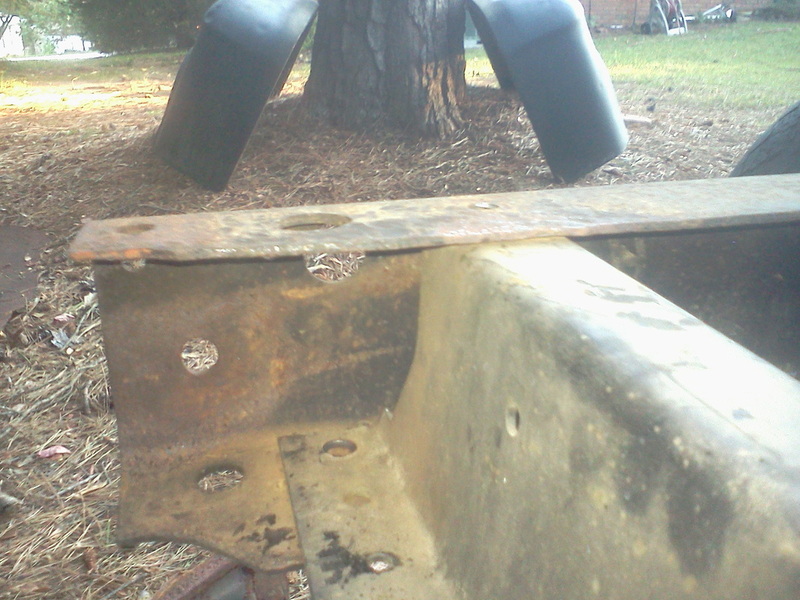 The tailgate and bulkhead came off easily too. The rear section of the frame is bent. 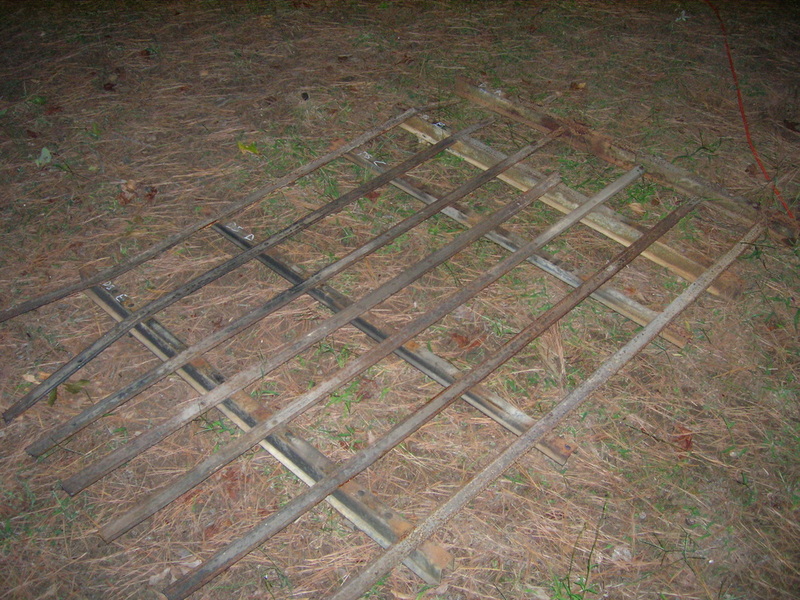 The rest of the frame is straight. 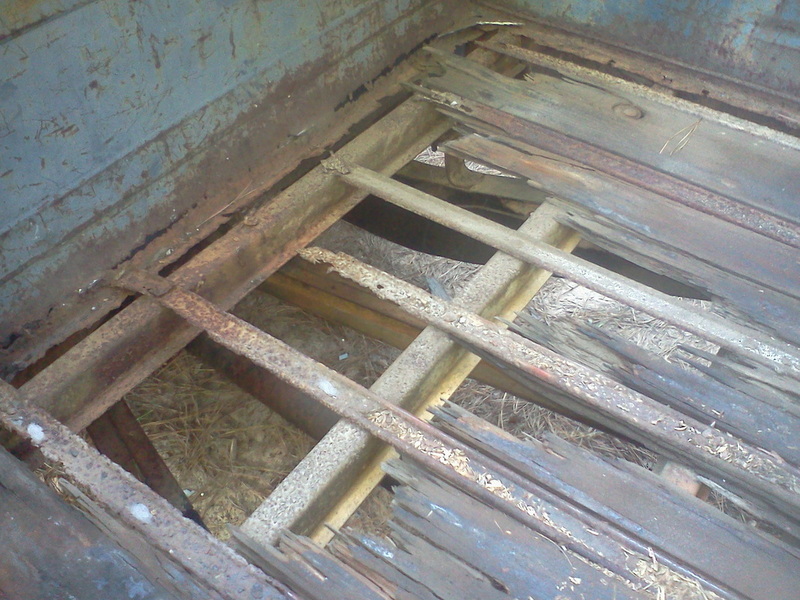 10/21/2011 Inspection of the frame that was under the bed revealed very little rust. Everything appears to be in excellent shape. The badly rusted bed strips cannot be used again. The bed strips were removed from the bed crossmembers. 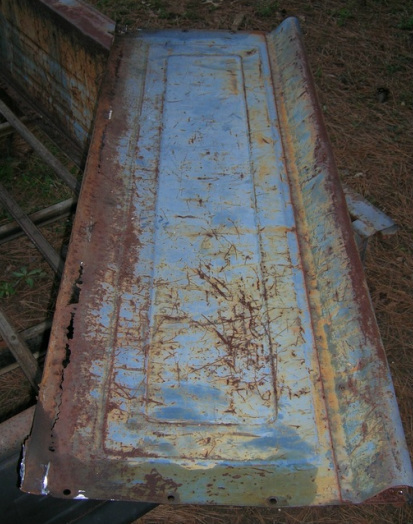 The sides of the bed are in great condition. 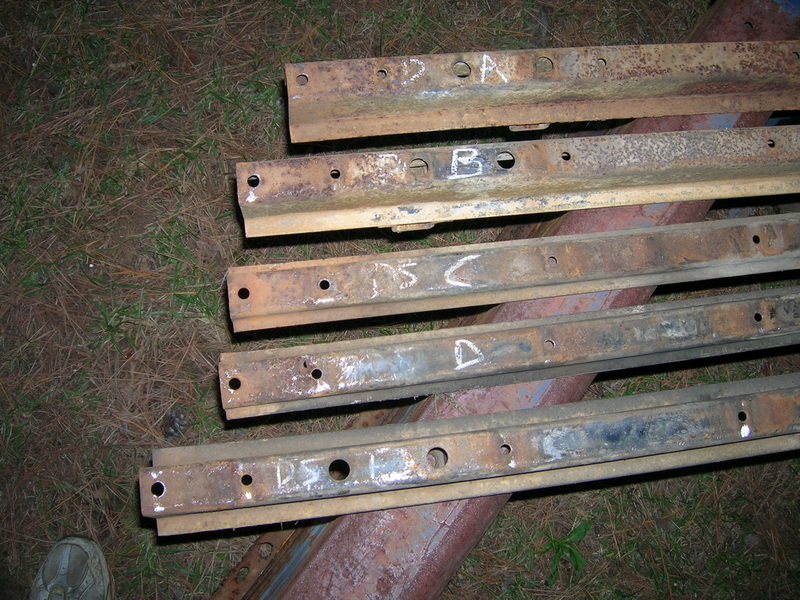 Bed crossmembers are carefully labeled for later reference. Ahhhh! Saturday again! 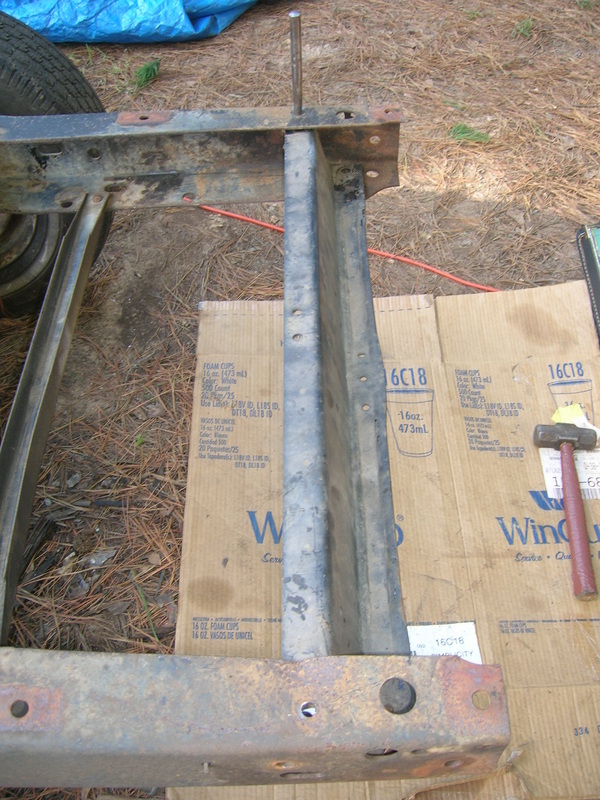 10/22/2011 I thought "What should I do about my truck's bent frame crossmember?" Forum members on Stovebolt.com suggested I remove it and either replace it or have it reshaped. 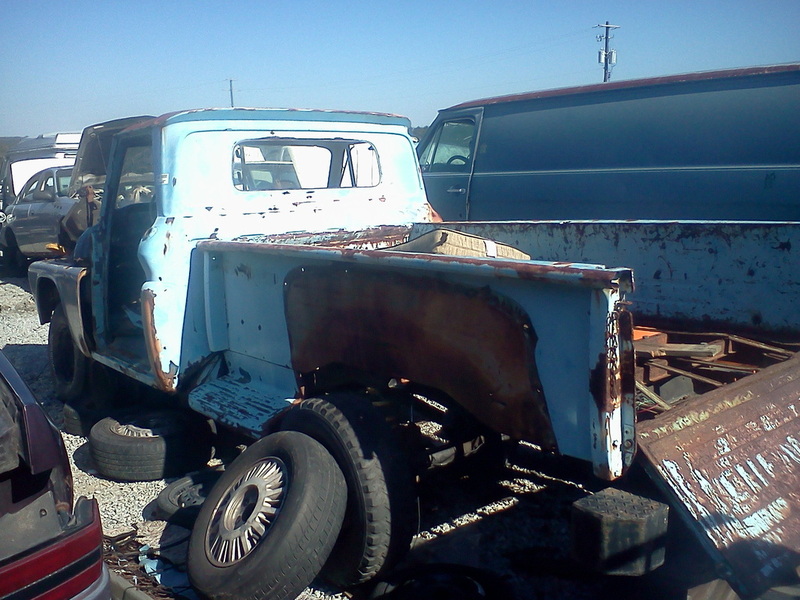 Lucky for me, there is a 1965 C10 at the salvage yard nearby. 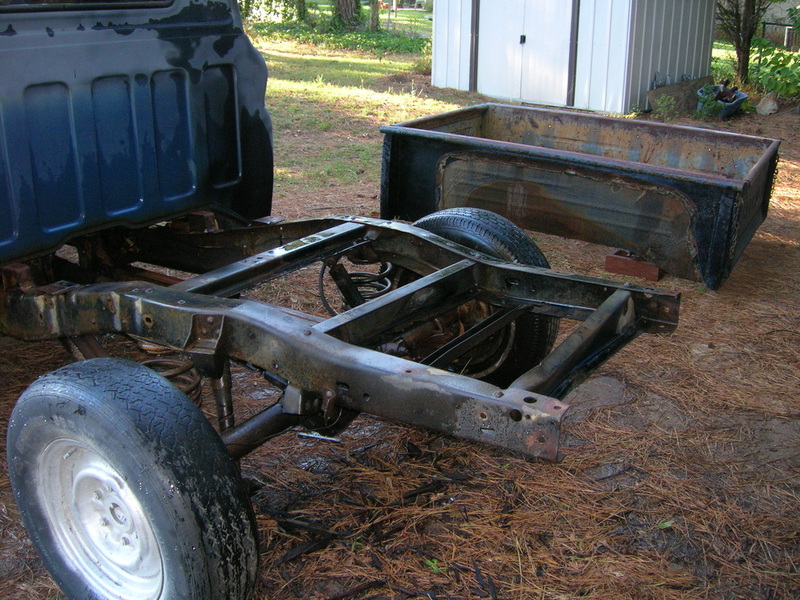 I was worried that I would not be able to remove the frame piece from the donor C10, but with determination and a good cordless drill, I had it off the truck in 30 minutes. WooooHoooo! Now I have a nice replacement piece. 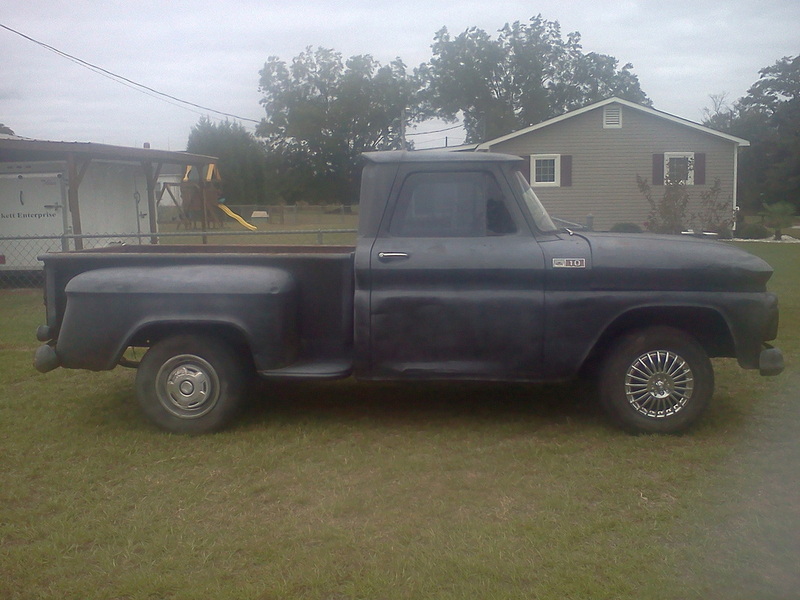 This is the 1965 C10 long bed donor truck. 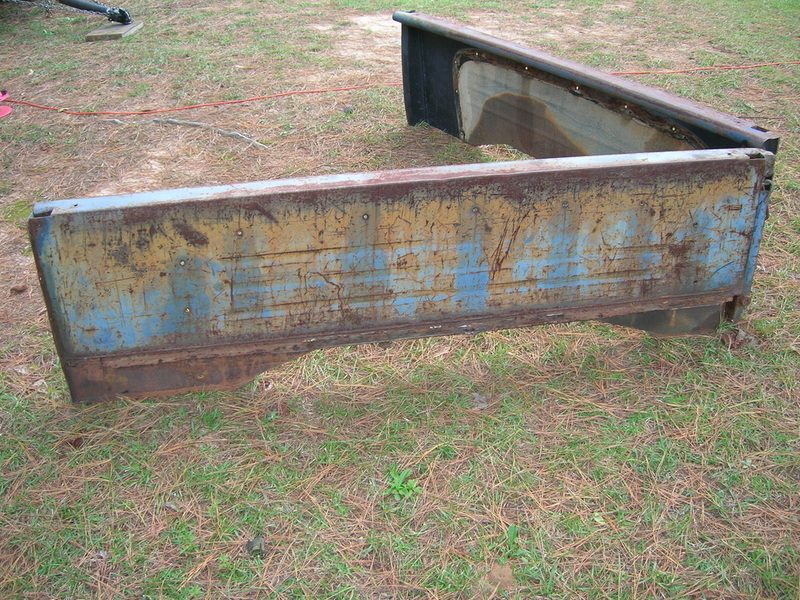 up next to the bent crossmember. kink where the rear crossmember connects. 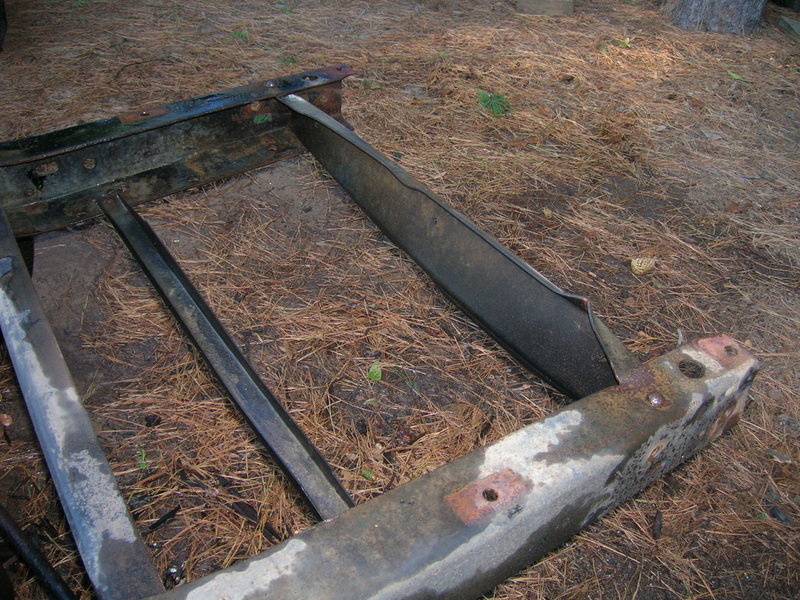 Here's the freshly removed frame crossmember. 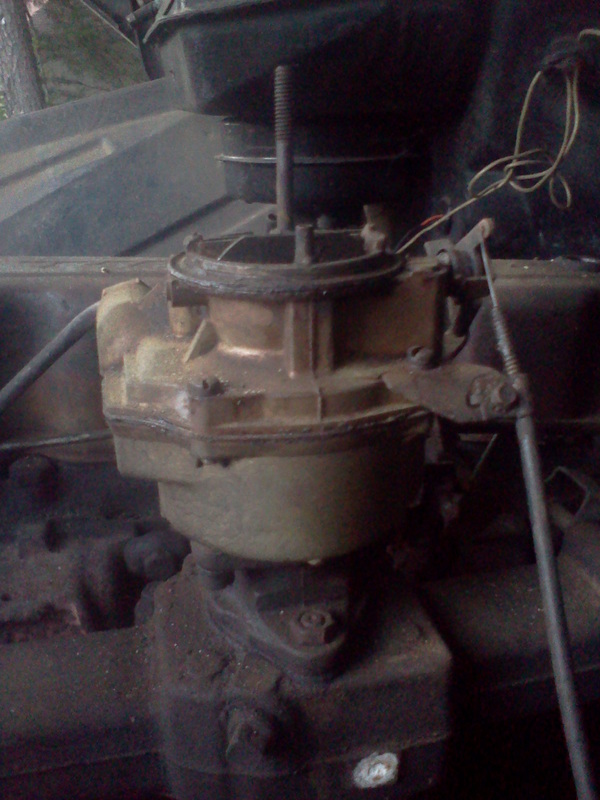 I need to search for the proper rivets. to make the repair in less than 10 minutes. on the BODYWORK PAGE to see more!